Good walk up Mount Wellington via The Springs, and Pinnacle and Zig-Zag Tracks. Cold breeze on the summit plateau, and the main benefits were good exercise, fresh air and occasional good views. The squally showers were bracing, but they did provide the right conditions for rainbows in the view. I seem to never get the opportunity to include a rainbow, let alone a double! Thanks John. 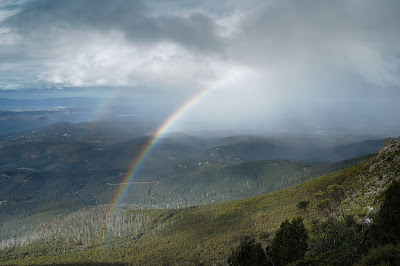 Actually I was very pleased to get the photo, as I had just slogged up the ZigZag Track while the heavy shower fell on me - same shower that moved on and provided the rainbow. It was nice when the sun came out and the rainbow appeared.